Well, going from the sublime (Seeley) to the ridiculous (Harley). 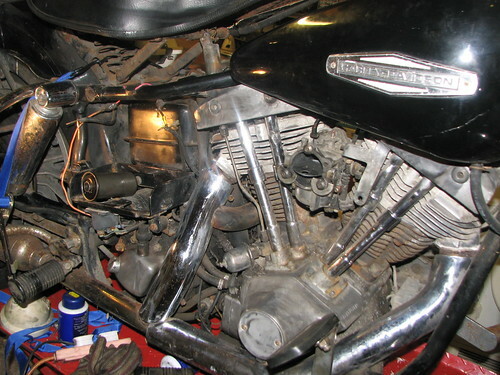 I have this 1976 Electra Glide to fettle for a friend. Lump hammers and cold chisels have been assembled. Does anyone know how the brake calipers are removed ? Crickey!..if you're takin' that on to "do up" he must be a good friend!....if all else fails I've got a box of matches! 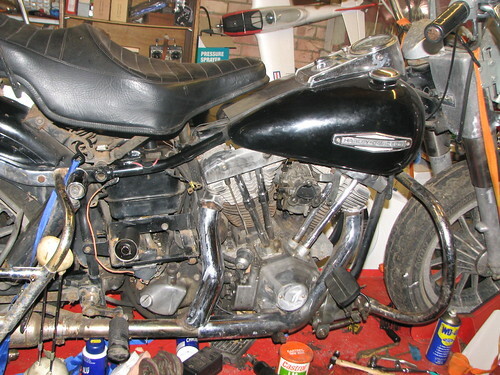 Allen bolts on Mrs Hooli's Sporty too, so it seems a long running HD tradition. Been away in sunny Florida (work, work, work, work ) Watched a rocket shoot into the sky yesterday, just a bright light from where I was. Anyway, brake calipers (Banana type apparently) were held together with 4 Torx bolts. I used a regular socket to undo them as you have to split the caliper to get at the pads. New pads arrived whilst I was away so not much left to do except cleaning and re-assembly. Picked up a bunch of parts I had ordered this morning so enough to keep me busy for the weekend. Like the Triumph I will need to strip the primary case side out to replace the engine sprocket (bugger) but it really does need a new Chain/Sprocket set. I'll post some photos of progress as it happens. SO!..how's the Gunk an' Solvol workin' then?